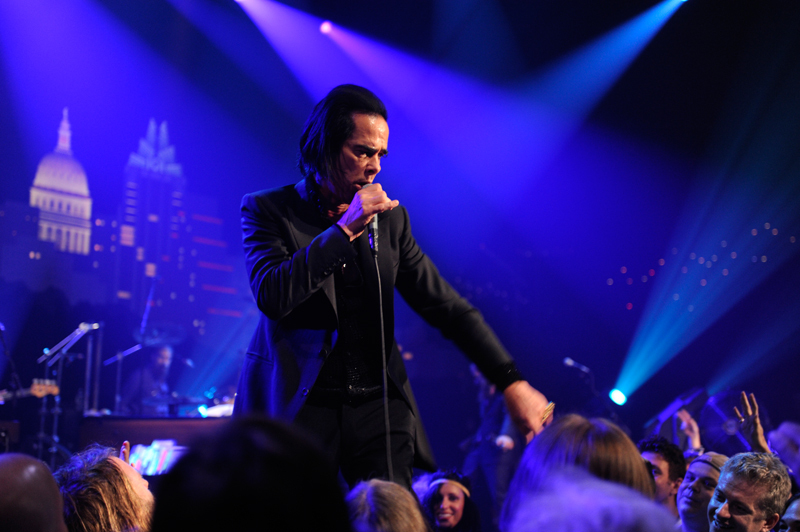 Austin City Limits presents an electrifying hour with Nick Cave & The Bad Seeds, one of the most exhilarating live acts in music. The noir-rock outfit make their ACL debut in an hourlong performance offering a memorable career-wide set powered by dark songs of love, death, God and fate. 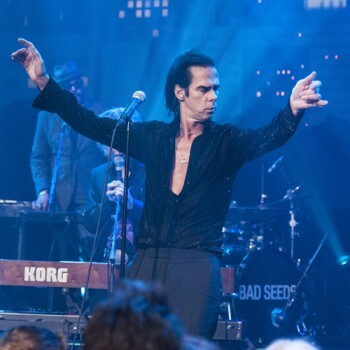 Nick Cave is one of contemporary music’s most powerful personalities, and the Australian-born iconoclast takes the ACL stage with his longtime band for a mesmerizing appearance. The masterful nine-song set features highlights from their 30-year career, spanning the 1984 debut to 2013’s universally-acclaimed Push the Sky Away, their fifteenth studio album. The black-clad Cave stalks the ACL stage with primal energy and explores the thin line between light and darkness with selections from his fire-and-brimstone universe, spouting scripture-scaled narratives and anti-anthems from his rogue’s gallery of characters. “Tupelo,” a twisted take on the mythos surrounding Elvis Presley, has the singer-songwriter ranting like an evangelist fallen from grace and intent on clawing his way back. Cave looks directly into the heart of darkness with a piano-based rendition of the “The Mercy Seat,” a murderously powerful first-person account of execution by electric chair that progresses from the sinister to the sublime. 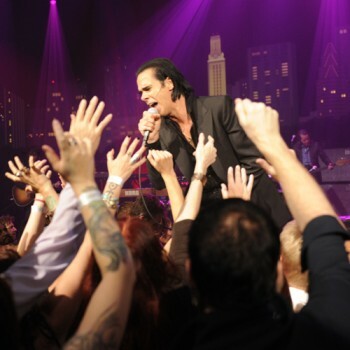 The episode comes to a show-stopping end with the title track from their recent worldwide chart-topping release; as Cave sings the lyric “Some people say it’s just rock ‘n roll, ah, but it gets you right down to your soul,” the Austin crowd is rapt under his spell and ready to preach the gospel of Nick Cave & the Bad Seeds. Tune in this weekend for this episode, and, as always, check your local PBS listings for the broadcast time in your area. Go to the episode page for more info, and don’t forget to click over to our Facebook, Twitter and newsletter pages for more ACL info. Next week: Los Lobos and Thao & the Get Down Stay Down. 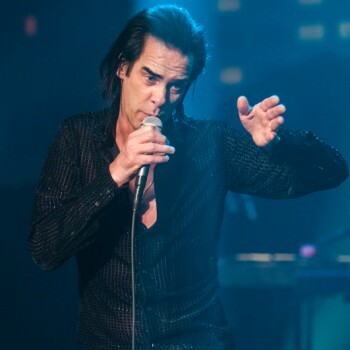 A recent New York Times Magazine profile of Nick Cave noted that “Cave can claim at least half a dozen vocations: songwriter and performer with the Bad Seeds and their garage-rock offshoot Grinderman; screenwriter of the acclaimed (and extremely gory) movies The Proposition and Lawless; novelist; film-score composer; lecturer; script doctor; and on certain (perhaps thankfully) rare occasions, even actor.” While rightly celebrated for all of the above, the live experience is where Nick Cave & the Bad Seeds justify and defy hyperbole. Following a sold-out tour last year, the band have been traversing the U.S. once again, leaving audiences and critics alike awestruck. The response has been unparalled. 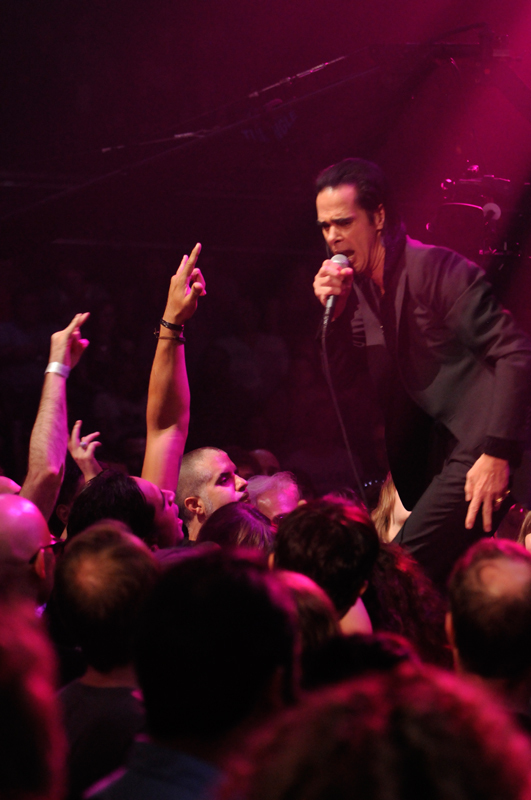 A critic from Mother Jones claimed the band’s San Francisco show restored his faith in rock ‘n’ roll and urged the masses, “For God’s Sake, Stop What You’re Doing and Go Buy Tickets to See Nick Cave!” In Portland, the Willaimette Week called the performance “a master class in rock, and not something anyone present will ever forget.” The Denver Post saw “the devil in an evangelist’s clothes, oozing the sexuality of early rockers like Elvis Presley and Jerry Lee Lewis coupled with the punk innovation of Iggy Pop.” In Minneapolis, the City Pages remarked on the audience experience: “We became unified in the moment as one sordid congregation, and from here we would follow anywhere Cave chose to lead us.” The most commonly recurring word to emerge from the collective audience bearing witness to a Nick Cave & the Bad Seeds show? Unforgettable. 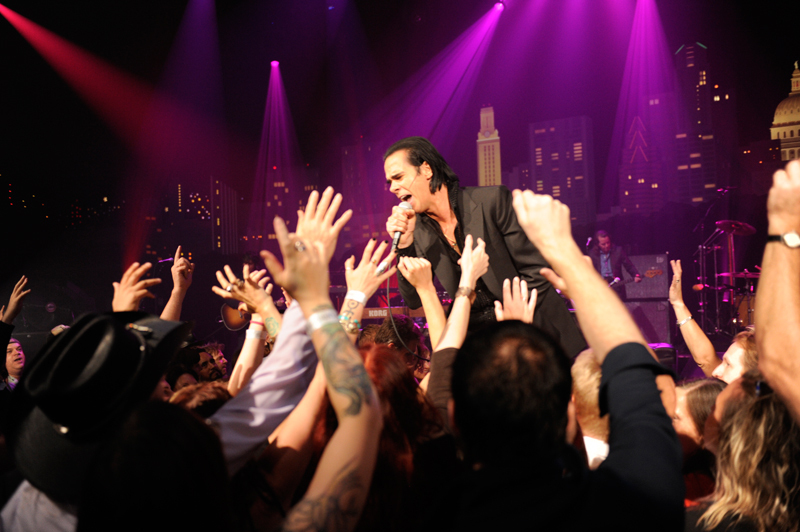 For this episode, Nick Cave & the Bad Seeds – Nick Cave, Warren Ellis, Barry Adamson, Martyn Casey, George Vjestica, Jim Sclavunos and Conway Savage – bring their perfectly crafted and incendiary set to Texas, as they make their Austin City Limits debut with songs from their most recent release, the universally regaled Push the Sky Away, as well as others from a legendary back catalog. 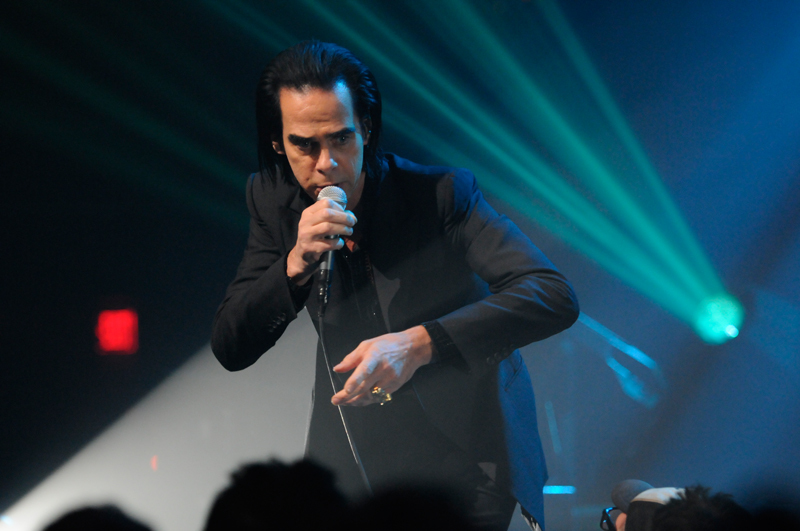 Nobody explores the thin line between light and darkness as well as Nick Cave & The Bad Seeds. The Australian native and British resident has spent 30 years amassing a rogue’s gallery of killers, creepers and unsavory characters of all types. Yet he’s also capable of stripping away the grime and debauchery to give life to languorous love songs that border on the spiritual. His international band of brigands – including righthand man Warren Ellis and original Bad Seed Barry Adamson – are equally adept at shimmering beauty and hellacious noise, depending on the mood the song requires. 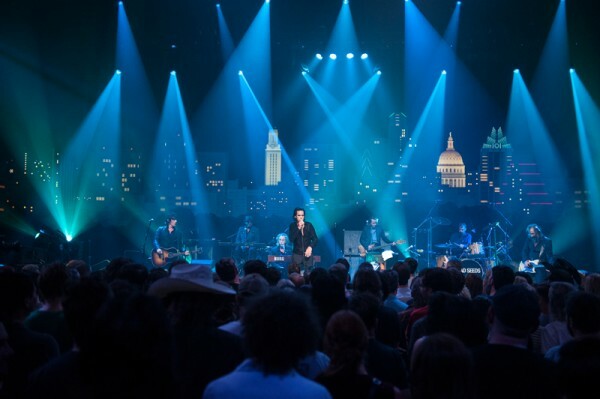 That yin/yang contrast, a dichotomy on which Cave and the Seeds have built a successful three-decade career, exploded in full effect for the band’s first taping for Austin City Limits. With an unusual (for us) stage setup that featured two ramps allowing the stage-stalking Cave to join the crowd, the band arrived to the electronic thrum of “We Real Cool,” one of the singles from his latest LP Push the Sky Away. The brooding amble of “Jubilee Street” seemingly continued the sedate mood, but ramped up the energy of a tent revival in no time for the first of the evening’s standout performances. The quiet dismissed for the moment, the Seeds launched into the explosive “Tupelo,” a twisted take on the mythology surrounding Elvis Presley that had Cave raving like a hellfire-and-brimstone preacher fallen from grace and grimly trying to claw his way back. From then on the dark and the light battled for supremacy. In the former’s corner: the creeping crawl of Cave’s serial killer ode “Red Right Hand” (made infamous in part by its use in The X-Files) and the rock ‘n’ roll savagery of the obsessive love song “From Her to Eternity,” the title track of the first Bad Seeds album. In the latter’s: the religious authority satire “God is in the House” and the unusually straightforward romantic sentiments of “Love Letter,” both keying on Cave’s sensual croon and piano. The sonorous “Mermaids” and the rambling “Higgs Boson Blues,” one of the most discussed tunes on Push the Sky Away, seemed ambivalent toward the balance of good and evil, letting Cave ponder issues of modern technology shaping the inconsistency of memory. That was apparently all the clemency Cave had left in him, though, as the Seeds launched into “The Mercy Seat,” the murderously powerful first-person account of execution by electric chair that has become the band’s signature song. 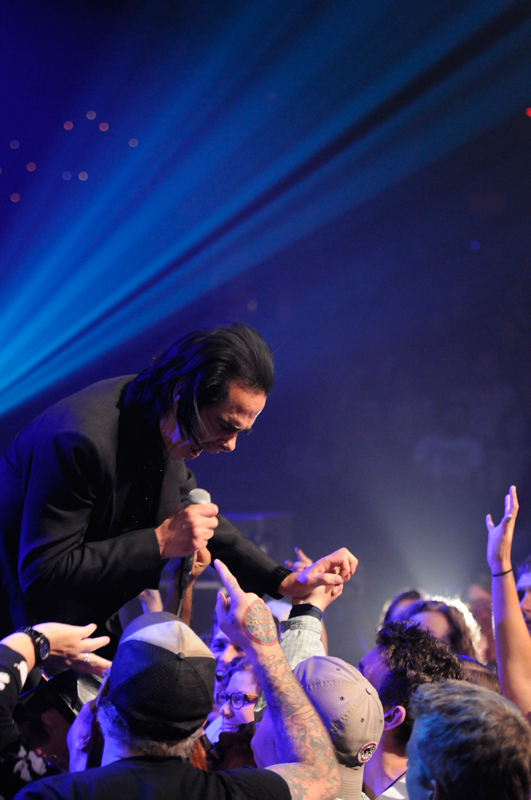 That was merely a warm-up, however, for “Stagger Lee.” Cave’s aggressively profane version of the century-old folk song pushes the original’s braggadocio into deliberately over-the-top heights of arrogance and violence, and his especially intense performance had the audience howling for blood. There was no way to top that kind of ferocity, so the band didn’t try, wisely choosing to close the show with the austere beauty of the title track to Push the Sky Away. It was the perfect comedown for the rollercoaster ride of a Bad Seeds performance, moving from devil to angel and all points in between. 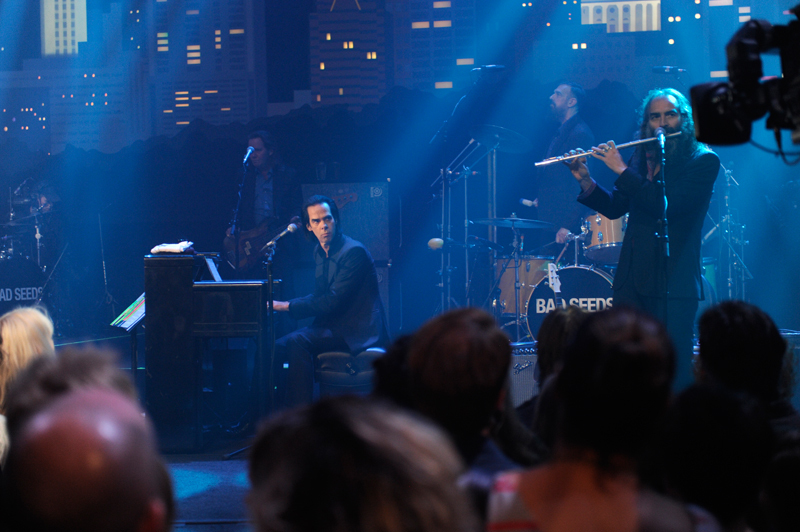 We can’t wait for you to see Nick Cave & The Bad Seeds in action on the ACL stage – watch your local listings this fall. Austin City Limits congratulates all the nominees for the 60th Annual Grammy Awards. We’d like to give special recognition to the nominees who have appeared on ACL. 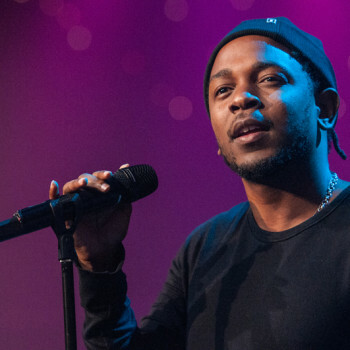 Big congratulations to Kendrick Lamar, a top contender with seven nominations. The Compton hip-hop trailblazer earned nods for Record of the Year, Album of the Year, Best Rap Performance, Best Rap/Sung Performance, Best Rap Song, Best Rap Album and Best Music Video. We’re thrilled to be showcasing many of this year’s nominees during our current Season 43, stay tuned for new episodes and congratulations to Chris Stapleton, earning top honors with nominations for Best Country Album, Best Country Song and Best Country/Solo Performance; LCD Soundsystem, for Best Dance Recording and Best Alternative Music Album; Father John Misty, for Best Alternative Music Album and Best Recording Package; Jason Isbell & the 400 Unit, for Best Americana Album and Best American Roots Song and Run the Jewels for Best Rap Song for their collaboration with Danger Mouse. You can see all of these artists’ brand new episodes in early 2018. We’re also chuffed for fellow nominees whose episodes kicked off the first half of our 43rd season: Ed Sheeran, for Best Pop Solo Performance and Best Pop Vocal Album; Miranda Lambert, for Best Country/Solo Performance and Best Country Song; and Zac Brown Band, for Best Country Duo/Group Performance. Additional congratulations to the talented ACL veterans who received top nominations: Foo Fighters, for Best Rock Performance and Best Rock Song; Coldplay, for Best Pop Vocal Album and Best Pop Duo/Group Performance; CeCe Winans for Best Gospel Album and Best Gospel Performance/Song; the Allman Brothers’ Gregg Allman (R.I.P.) and the Mavericks, both for Best Americana Album and Best American Roots Song; Alison Krauss for Best Country/Solo Performance and Best American Roots Performance; The National, for Best Alternative Music Album and Best Recording Package; Ladysmith Black Mambazo for Best World Music Album and Best Children’s Album; Nick Cave & the Bad Seeds for Best Music Film and Best Boxed or Special Limited Edition Package and the late Leonard Cohen for Best Rock Album and Best American Roots Performance. We’re proud to note that four of the five noms for Best Alternative Music Album comes from ACL vets: Arcade Fire, LCD Soundsystem, Father John Misty and The National. Shout-outs as well to Queens of the Stone Age, Sarah McLachlan, Beck, Arcade Fire, Juanes, The War On Drugs, Alabama Shakes, Reba McEntire, Blind Boys of Alabama, Rodney Crowell, Damian Jr. Gong Marley, Aimee Mann, Randy Newman, Robert Cray, Taj Mahal and Keb’ Mo’, Natalie LaFourcade, Portugal. The Man, Robert Randolph & the Family Band, Iron & Wine, Tedeschi Trucks Band, Punch Brothers’ Noam Pikelny and the late Glen Campbell for their nominations. A full list of all nominees can be found here – good luck to them all. Co-produced by ACL executive producer, Terry Lickona, the 60th Annual Grammy Awards will telecast on Sunday, Jan. 28, 2018. Austin City Limits is pleased to announce a new taping with rising soul/rock stars St. Paul and the Broken Bones on November 20. Formed in 2012 in Birmingham, Alabama, the sextet hits the ACL stage in support of its new album Sea of Noise. Recorded in Nashville with producer Paul Butler (Michael Kiwanuka, Devendra Banhart), the LP is a successor to the Broken Bones’ 2013 debut album Half the City, which introduced the group’s blazing mating of ‘60s soul fire – daubed with latter-day influences like Sly Stone, David Bowie, and Prince — to frontman Paul Janeway’s impassioned singing and writing. The new album witnesses a deepening and broadening of the unit’s musical reach and lyrical concerns, including strings arranged by legendary Stax Records arranger Lester Snell and words influenced by Tom Waits, Nick Cave and Bryan Stevenson’s book Just Mercy. The album’s lyrical and emotional richness is heard loudly in stunning new compositions like “Burning Rome” (which Janeway describes as “a letter to God, if I could write it”) and the startling “I’ll Be Your Woman,” which knocks traditional soul music gender roles on their heads. Of the finished work, Janeway says, “Sea of Noise is not quite a full-blown concept record. 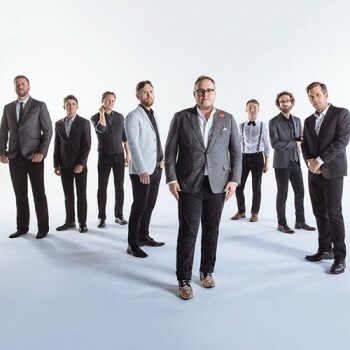 It is focused in terms of subject matter – finding redemption and salvation and hope.” Hot off gigs opening for the Rolling Stones and a slot at this year’s Austin City Limits Music Festival, St. Paul and the Broken Bones brings their take-no-prisoners live show to our studio for what promises to be a memorable ACL debut. Want to be part of our audience? We will post information on how to get free passes about a week before the taping. Follow us on Facebook and Twitter for notice of postings. Austin City Limits is pleased to announce that we will be streaming our taping with Cassandra Wilson live on Tuesday, April 28, 8pm CT/9pm ET. The taping will webcast in its entirety via our YouTube channel. Grammy-winning American jazz musician, vocalist, songwriter, and producer Cassandra Wilson makes her ACL debut, armed with her acclaimed new LP Coming Forth by Day (Legacy Recordings), an homage dedicated to the beauty, power, and genius of Billie Holiday. 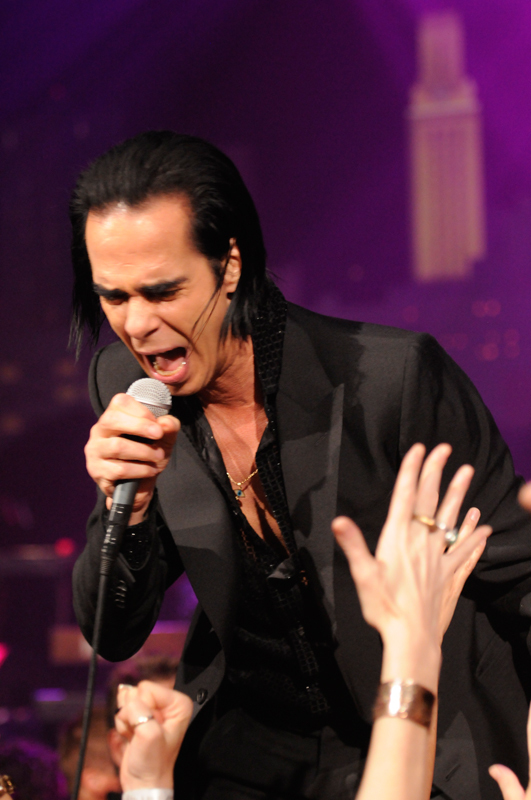 The album boasts a surprising cast of characters: produced by Nick Launay (Nick Cave’s producer), string arrangements by Van Dyke Parks, guitar from T Bone Burnett and the Yeah Yeah Yeahs’ Nick Zinner, and rhythm section from The Bad Seeds (drummer Thomas Wydler and bassist Martyn P. Casey). Critic Gary Giddins describes Wilson as “a singer blessed with an unmistakable timbre and attack who has expanded the playing field” by incorporating blues, country and folk music into her work. A native of Jackson, Mississippi, Wilson moved to New York City in the early 80s, met saxophonist Steve Coleman and became one of the founding members of the M-Base Collective. She signed with Blue Note Records in 1992 and released the landmark album Blue Light ‘Til Dawn, which paved the way for a new generation of jazz singers seeking an approach and repertoire that challenged the supremacy of the American Standard songbook. The broadcast version of this show will air this fall on PBS. 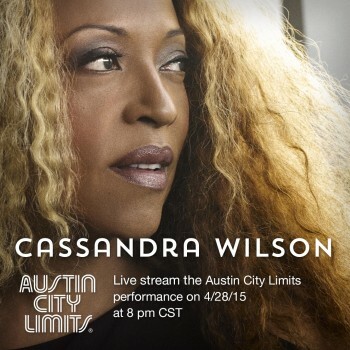 Join us for this live webcast of the Austin City Limits debut of Cassandra Wilson. 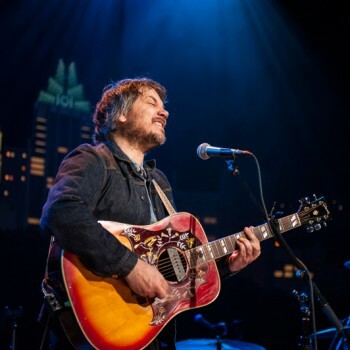 Austin City Limits presents a Season 40 highlight—the return of ACL veteran Jeff Tweedy for a very special hour of music. The Wilco leader showcases his new solo project Tweedy, joined by son Spencer and their special guests, as they perform a mix of new songs and Wilco classics. 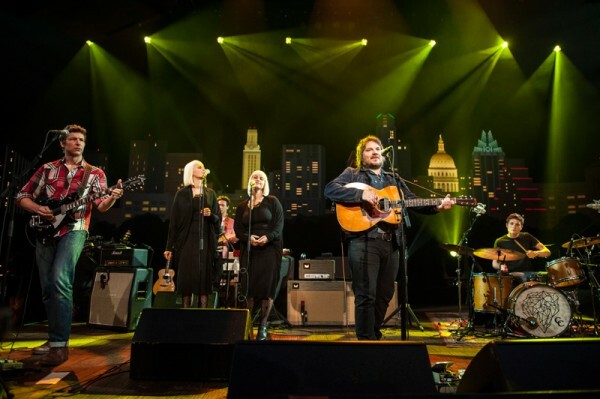 As a longtime favorite son of ACL, it’s only fitting that Jeff Tweedy returns to the ACL stage with his own son for the show’s milestone 40th anniversary season. 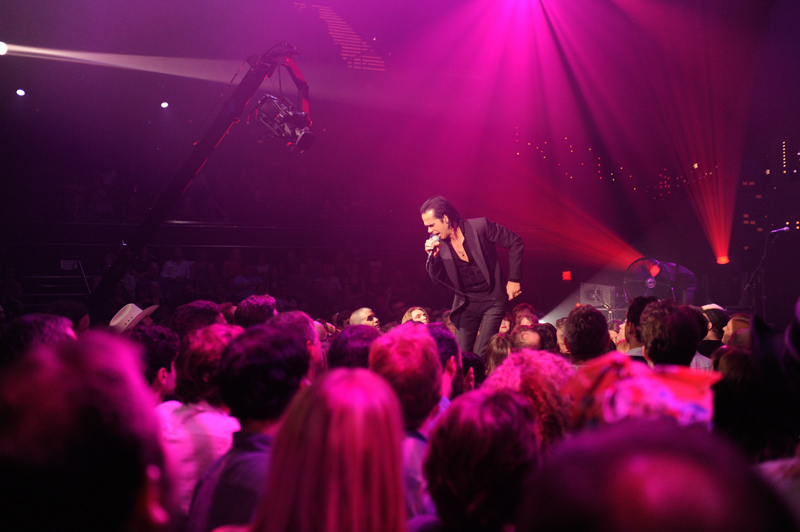 The esteemed singer-songwriter has appeared on ACL four times previously with his main outfit Wilco, starting back in Season 25. This new installment marks his first-ever solo outing for ACL, accompanied by his 18-year-old son Spencer Tweedy on drums, with lush harmonies from Holly Laessig and Jess Wolfe of the band Lucius. Tune in this weekend for this episode, and, as always, check your local PBS listings for the broadcast time in your area. Go to the episode page for more info, and don’t forget to click over to our Facebook, Twitter and newsletter pages for more ACL info. 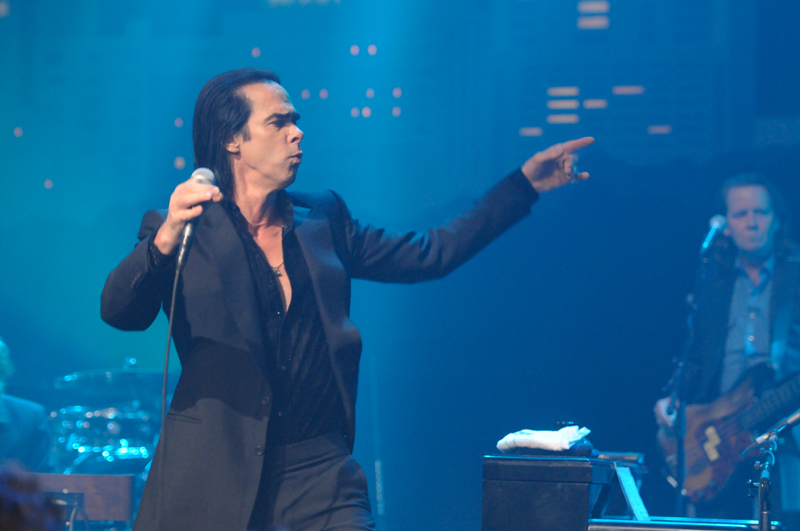 Next week: Nick Cave & the Bad Seeds.